Hay fever is caused by common allergens like mold, pollens, pet dander, or dust mites. The symptoms of hay fever are often confused with cold symptoms, but hay fever is an allergic reaction and isn’t caused by a virus. Allergic rhinitis not only makes you feel miserable, it can interfere with your sleep, worsen asthma symptoms, or cause sinusitis or ear infections. Seasonal allergic rhinitis, also called hay fever, is caused by common allergens like mold, pollens, pet dander, or dust mites. Are the symptoms more pronounced during a certain time of year? If so, pollens that are prevalent during that season may be triggering the symptoms. For example, in the spring tree pollens are more prevalent, but in the summer you see more grass and weed pollen. In fall and late summer, there is a lot of ragweed. If symptoms last all year, they are usually due to dust mites, molds, and animal dander. Do the symptoms act like a cold? Colds usually occur 1 to 3 days after you have been exposed to a cold virus and last 3 to 7 days. But hay fever symptoms occur immediately after you have been exposed to allergens and persist as long as the allergens are present. 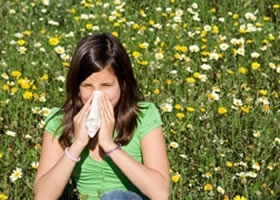 Children who have hay fever may seem like they are sick all the time. Colds are sometimes accompanied by a fever, but hay fever is not, despite the name. If you think your child may have allergic rhinitis, contact your pediatrician. It can be helpful to keep a diary of symptoms to determine when they are occurring and any triggers. A simple blood test can also help identify if your child has some of the more common allergies. Allergic rhinitis not only makes you feel miserable, it can interfere with your sleep, worsen asthma symptoms, or cause sinusitis or ear infections. Your best bet is to try to avoid the allergens as much as possible, but there are also some over-counter and prescription medications your pediatrician can recommend.